After church, we’d head to the fellowship hall for Easter brunch. In our later years, we were the ones to make and serve it. And it was always a similar menu – muffins, fruit cocktail, coffee, orange juice, and egg bake. Over the years I’ve had me many an egg bake. As a church youth director, I made the requisite egg bake each Easter for the youth brunch. Then serving on a church committee, we perfected the recipe and made it for the vendors & visitors at our church holiday craft sale. And now, I have another recipe to add to the pile. The difference? This one is made in one pan. Score! Melt butter in a large skillet over medium heat. 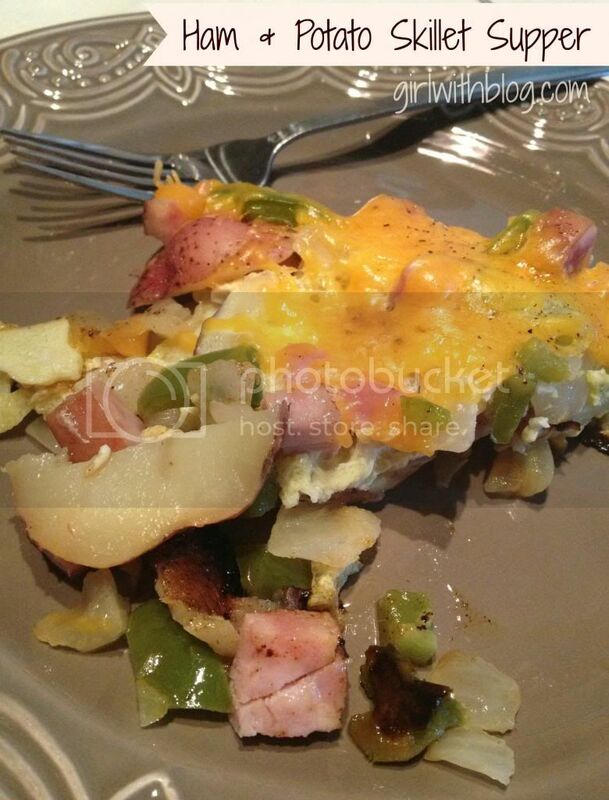 Layer half each of the potatoes, onion, green pepper and ham in skillet. Repeat layers; season with s&p. Cover and cook for 10 to 15 minutes, until potatoes are tender. Pour eggs over potato mixture; cover and cook for 3 to 5 minutes, until eggs are almost set. Sprinkle cheese over all. Remove from heat; cover and let stand until cheese is melted. Cut into wedges to serve. Serves 6. The brand new Gooseberry Patch cookbook 101 Stovetop Suppers is chock full of one-pan meals. I also really appreciate that there are many recipes that don’t use condensed soups or processed ingredients (this one is a good example. Easy to customize for your needs and tastes). Be sure to enter to win a copy of your own – the giveaway is open for a few more days! It was very good and simple to prepare! I did use 6 eggs to cover everything evenly, although I used 6 potatoes (they were small) and layered everything until I ran out. I also added lots more salt and pepper! Thanks for the recipe!